Grilled Pork Chops with Spinach Salad, Thyme for Cooking gourmet recipes. This has been one of our favorite spring salads for years. Use bone-in or boneless pork chops, whichever you like. 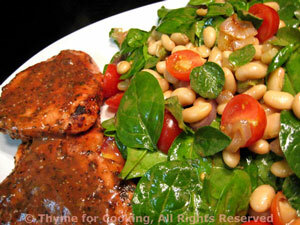 Spinach and white beans, a favorite salad combination, served with marinated, grilled pork chops for a simple early summer salad, full of heart-healthy foods. Mix tomato sauce, garlic, 1 tbs oil, 1 tbs vinegar, 1 tsp basil, 1 tsp oregano in shallow baking dish. Add chops and allow to marinate while preparing salad. Wash and tear spinach for salad if needed. Tear marjoram leaves off stems, but leave whole. In large bowl mix remaining vinegar, oil, and dried herbs. Add mustard and whisk well to combine. Add onion, toss well and allow to marinate. Cook pork chops (reserve marinade) on barbecue grill or broil (grill) for 6 - 8 minutes per side, depending on thickness, until done. See techniques for tips. Chops can also be pan-fried for about the same amount of time. While chops are cooking, mix cornstarch into reserved marinade in a small sauce pan. Bring marinade to a simmer over medium heat, stirring until thickened. When chops are almost done add beans, marjoram, spinach and tomato to vinaigrette/onions and toss well to combine. Arrange salad on plates, add chop and serve, sauce on the side.